As I entered the Compassion Gym, the air was abuzz, staff in compassion wings scurrying to finish the set-up, volunteers arriving to man their stations, fresh coffee brewing, all in readiness for the community to arrive. Bare gym walls, now beautified with gorgeous hanging sari cloths in reds, greens and golds, intimate tables with tea lights, and bulletin boards overflowing with compassionate sayings, set the inviting tone of the day. Right away I recognized that incredible cooperation and preparation had to have taken place well before this day. Frog Hollow staff, Lea and Diane, Lynn and Maria from the Dalai Lama Centre, and so many other committed volunteers and community members together created the seamless setting and flow of the day. 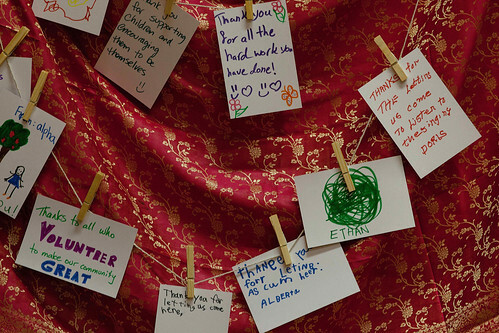 As the hours passed, the draped walls became ornamented with cards from the heart, appreciations, and wishes for the community. 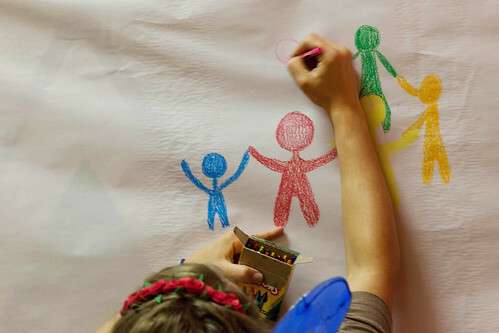 People placed coloured dots on the six most important theme posters, the upcoming Dream event to make use of the most popular ones in envisioning future community plans. Strolling about the Compassion Gym, I saw the sounds and tastes of these themes already in action at the stations set up. Meigan, an art therapy student, was encouraging the Dream Wall drawings. Meigan sees art as a window of connection and fun through which creative exploration can bring together differing perspectives leading to new discoveries. At the Filming Station I met Jacqueline, a volunteer from the aboriginal community, with a background in dialogue, trust-building, co-op radio, and tai chi instruction at Frog Hollow. 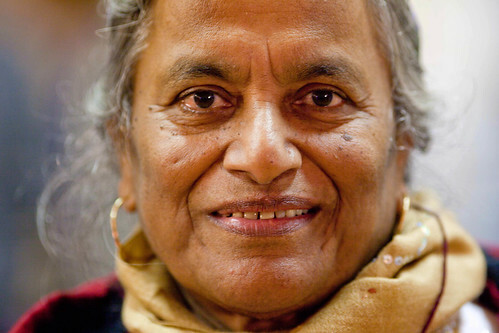 She invited participants to video-record their stories of giving or receiving compassion. Jacinda, in charge of the Soul Sister station, showed all who gathered there how to make the tiny dolls that she had learned to make with her mom years before. Having no sisters, but great friendships with other girls, the Soul Sisters symbolized her strong connection to women in community. Jacinda introduced the people around her table to each other, helping Alberta and her mom choose the colours for their doll. At the push-pin board, hundreds of definitions of compassion were on display. These had been brainstormed by the community and used to help determine the themes of the program. Slips of paper, large and small, with written, printed and typed definitions were posted, with a call to add translations in the many languages and voices of the community. At the video station, two tv screens with earphones were available for watching and hearing those who had already taped their stories of compassion. Members of the neighbourhood, some now volunteers in today’s event, spoke of those who model led compassion to them or those to whom they offered compassion. Jagjit, a woman from India, spoke of her family members and the help and support they provided to her, setting an inspiring example. I could see that whoever had filmed these storytellers had made them feel comfortable and confident enough to see their stories as important to share. At the tea and talk table, tea and cookies provided a homey atmosphere for conversation and sharing! Tessa and Anna spoke with those stopping to rest, inviting memories of being touched by compassion, co-operation, and confidence. Mid-room, a large screen was set up, Maria, from the Dalai Lama Center showing ongoing slides of previous events in the project. Most recent was the Frogs in the Park day. The slides, as a visual way to look back and remember, gave the community pride in its efforts and achievements.The Wishing Well, beautifully decorated, was also placed near the centre of the room, the donations to be sent to Children’s Hospital. The Girl Guides helped with this station, serving as compassion ambassadors. One mom wrote that her 3-year-old told her that he saw her thank and hug someone for doing a good deed. She realized that her boy was watching her every move, filling her with a sense of immense responsibility and a desire to show him more positive behaviours. Colourful picture postcards, designed in the community, were at another station where children and adults could send them to those who had touched them with compassion. Similarly, thank-you letters and hearts of appreciation were decorated and written on, and then hung by clothes pegs onto the wall coverings. Yet another table had people creating compassion buttons to wear. I saw old and young people from many cultures, drawn to this table, voicing in many languages what words or pictures they were going to put on their buttons. Glittery pens, paper circles and a button-making machine were at the ready. I saw buttons with butterflies, rainbows, birds and flowers, and one with concentric circles of compassion rippling out from the centre. Compassion passports, stamped at each station, were deposited to enter a prize basket from Sweet Obsessions. Each of the first 100 families who came to the Compassion Gym received from Amy a very tasty Hallowe’en treat bag, filled not only with candies but also compassion quotes contributed by families in the community. 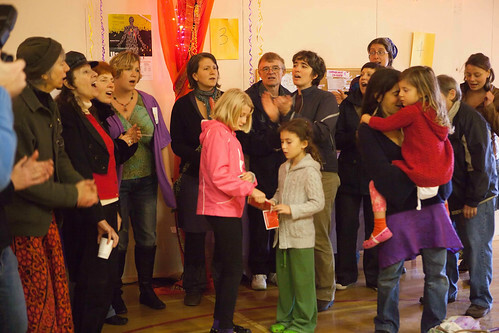 Part way through the morning, a community choir gathered and burst into song. Patti, the choir’s conductor, kept time with her feet, as did many of the children and adults singing along a capella. They started with Song to the Forest by the Baka people of Africa. During the afternoon, a VSO violinist filled the gym with the vibration of classical strings. “What can people and communities do to encourage compassion, co-operation, and confidence in children?” This question reverberated through the day. Conducting an event like this was certainly a very effective way to fulfil these aims. People came and went all day, steady streams of community members having a great time in a very purposeful way. Some arrived as part of the larger Pumpkin Patch event, curiously stepping into the Compassion Gym to see what was happening. “My wife is the school letter carrier,” said one man. “Oh, I live in this community,” said another. “My friend brought me,” said another. Families were there whose children go to the school. Baby strollers and carriages, aunties and cousins were there. People saw flyers in the community, at Frog Hollow or at the school. Robin, working in Frog Hollow’s kitchen today, was intently reading the wishes and appreciations posted on the Compassion Gym walls. The Stilt walker, taking part in the outdoor event, came in because her mom is part of the family program. What stood out for me was the strong sense of connection in this community. Everyone, no matter the wide diversity, came because of that connection; they knew someone involved, they were a volunteer, they lived or worked nearby, or they attended programs at Frog Hollow Neighborhood House. By the end of the day, the empty Dream Wall was full with words and drawings – “Bee” the change, someone had written alongside their bumble bee drawing. “Speak it, live it, demonstrate it,” said another contribution. When it comes to educating the heart, I was very impressed with the skills of the volunteers, their ability to call in participants to their stations, strike up conversations, and help people feel comfortable. They, too, came from various backgrounds, bringing with them their own expertise that was honoured here, often in matching so well with the station they were working at. They exhibited and embodied the confidence, cooperation and compassion that they are trying to encourage in the children of their own community, modelling it, leading the way. Many stations today connected the arts, the written word and oral communication to compassion and social responsibility. Listening skills were very evident, particularly at the various storytelling stations. There was a noticeable involvement with photographic, videographic, and sound media, and a strong connection to music. What the kids created or wrote was put on display and valued, to be kept and used for future endeavours. The themes of the program as developed by the community were not only displayed prominently, a constant reminder of why we were there, but seen, heard and enacted everywhere I turned. One child’s hanging note summed up the day so aptly: “This communty is goood because pepole or nice.” Yes, they are!